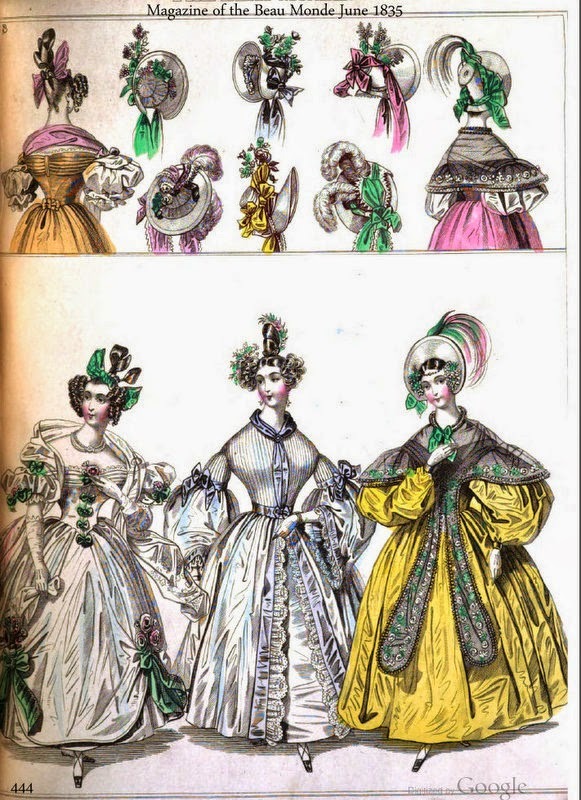 Along with the humungous sleeves and elaborate decorations, Romantic era fashions feature some wild and crazy hair and hats. The subject came up on my blog about pelerines, as we puzzled over why a lady was wearing a bonnet-like hat to an evening event. I’ve seen turbans and berets for evening dress, but this looked...odd. 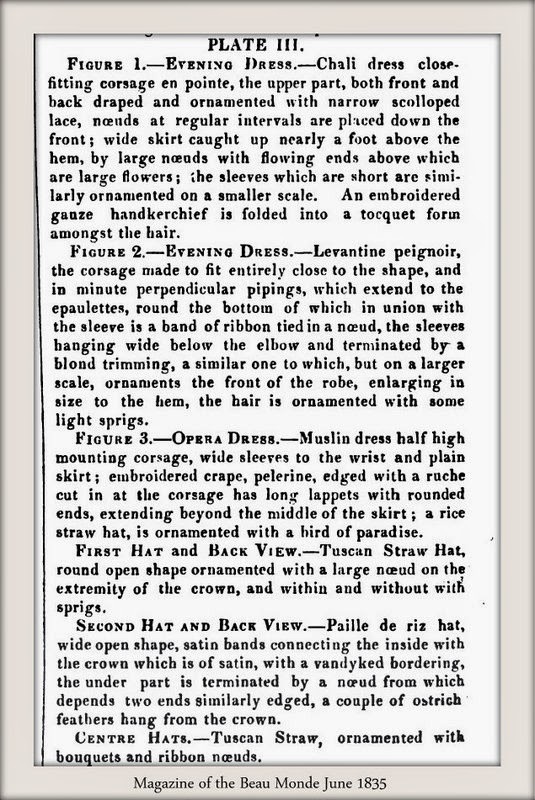 However, a reader mentioned that this might have been a fad, and the Cunnington book seems to confirm the idea, because it lists for evening coiffures in 1834, “dress hats, of rice straw with oval crown rather large.” I wonder, though, whether the lady kept the hat on all night, as she might a turban. Evening coiffures tended to be extremely elaborate (more on this topic in an earlier post). Wouldn’t they get mashed under a hat? 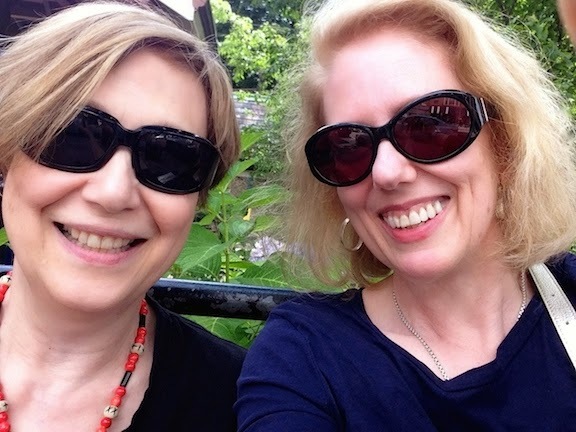 As someone who has to wear sunhats or suffer dire consequences, I am painfully aware of the deleterious effects on my coiffure—which is pretty simple to begin with. Even some of the flatter hairstyles from the time are so carefully arranged, I wonder what a hat would do to them. This requires further sleuthing. Meanwhile, for today: Since my heroes, like Vixen in Velvet's Lord Lisburne, are often bemused by my heroines’ hairdos, I thought I’d simply show you some examples of what he might be seeing. As always, please click on images to enlarge. Clicking on captions will take you to the source at Google Books. For some reason not all the color images appearing in the PDF appear online. You're thinking of a hat being like a modern hat that comes down over the head and may even be used to hide the hair. But at many times during the "hat fashion years," the hats sat on top of the coiffure (or even on top of a cap!) and might require to be pinned to the hair. Or, the hair might have been pulled forward to peek out from the hat. Looking closely at the illustration, I believe I see hats that meet those descriptions. The more I look at fashions the more I wonder at why we allow ourselves to look so ridiculous . I even wonder why some writing fantasy and futuristic novels can't seem to come up with something better than clothes of today. One would think females would finally get some sense about clothes. I like your research no matter the period. If one looks back to the 18th and 19th centuries with the hoops etc.= slightly revived in the late 1950's ( yes I had one) - one wonders if we have another period of such awkward clothes in store for the future. The shoes and hats of centuries ago have been seen in modern guise-- what else might we still see ?